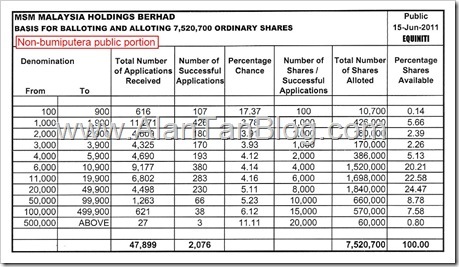 As I expected, the MSM Malaysia Holdings Berhad Initial Public Offerings(IPO) was oversubscribed! The final retail offering has been fixed at RM3.38 per share and the institutional price has been fixed at RM3.50 per share. Since the final retail price is 3.4% discount from its institutional price, do expect some price movement at the debut. This entry was posted on Thursday, June 16th, 2011 at 12:40 am	and is filed under stock market. You can follow any responses to this entry through the RSS 2.0 feed. Both comments and pings are currently closed.